Selecting a tank mixer requires consideration of a number of factors, including a tank’s volume, shape, turnover and the process goal. While there are many mixing technologies on the market, their performance and effectiveness varies greatly. A passive mixer uses the inflow of water into a tank to produce mixing. During periods of low demand (when mixing is most needed), passive mixers often fail to fully mix a tank. And for challenging applications, such as ice prevention and DBP removal, passive mixers are insufficient. Active mixers are motorized pieces of equipment that operate on electric grid or solar power and continuously mix tanks. This continuous, powerful circulation provides the most thorough mixing for tanks and enables operators to keep tanks full without sacrificing water quality. Blend time is the time required to fully mix a tank and is a reliable metric for evaluating mixing power – the faster the blend time, the more powerful the mixer. Being able to push the cold water at the bottom of a tank up through the warm layers of water at the top requires a powerful mixer and any mixing system must be able to achieve a fully blended tank in less than the cycle time of the tank. 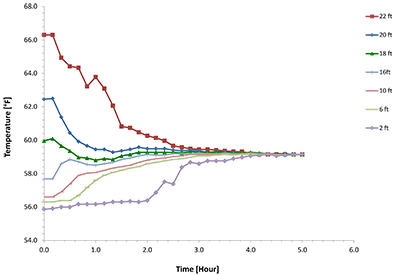 It is important to calibrate manufacturers’ claims with real-world blend time data (temperature and/or chemical). 3rd party studies comparing the performance of different mixing technologies show a large difference in mixing capability – while mixer price can vary by a factor of 3, performance can vary by a factor of 10 or more. 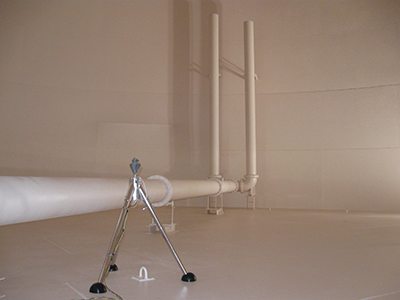 Read the case study from a Southern California utility evaluating two different mixing technologies in a 4MG tank.